One song out of the Cinderella score did become a major hit song. That song was “Bibbidi-Bobbidi-Boo”, subtitled “The Magic Song”. It began to enter the public consciousness–and the charts that track the positions of the popular songs of the day–at around the tag-end of 1949. Four versions of this song entered the “Billboard” charts. The first to arrive was Capitol’s contribution–a performance by an unlikely duet combination. Jo Stafford sang in a clear, organ-like mezzo-soprano. And she had, over a ten-year period, become a name on radio and records. Gordon MacRae had a more robust baritone. He, too, had a name–singing operetta roles over the air. Earlier that year, they had an unlikely hit with an old hymn “Whispering Hope”. Their duet on “Bibbidi-Bobbidi-Boo” (Capitol 57-782 on 78; 54-782 on 45), was just as unlikely. The disc entered the chart of best-selling records on December 31, 1949–but clicked most strongly with the nation’s disc jockeys. Of the four versions that “charted”,this was the only one that made the “best-seller” “disc jockey” and ‘juke box” charts. And, although it never got higher than #13 on any of these charts, it did pretty well. The next version to chart was by Ilene Woods–Cinderella herself. Her version, issued on RCA Victor 30-0019 (and 54-0014) had two non-consecutive weeks on he “best seller” charts. RCA also had the version by Perry Como (20-3601). This version gave the Stafford-MacRae platter some stiff competition, especially among the disc jockeys. Finally a Columbia biscuit by Dinah Shore (38659), had a week on the “best-seller” charts. There were several “also-rans” which might have sold in acceptable numbers–but not enough to make the ever-more-important “charts”. And one of those still brought in a lot of coin to the Santly-Joy interests–and thus to the Walt Disney studios. Mercury Records assigned “Bibbidi. . .” to Lawrence Welk’s orchestra. The record was released at a time when the firm was preoccupied with the sales of Frankie Laine’s “Mule Train”. But it might well have sold to Welk’s usual audience–which was well-placed in the Midwest and on the West Coast. Decca gave this song to Sy Oliver’s swinging band. Even more than “A Dream Is A Wish Your Heart Makes”, this seems like a miscasting. But we will hear from this version again in a future post. Decca released another version of this “magic song’. And, although Bing Crosby’s version on #24863 did not chart in its own right, the publishers got the money anyway. You see, Bing’s disc coupled the Disney number with Bing’s cover of “Chattanooga Shoe Shine Boy”. And that one reached way up in the charts. When that happens, the song on the flip side also gets the same amount of royalties from record sales. So, Disney came out ahead after all. While the individual records of “Bibbidi-Bobbidi-Boo” were getting noticed, and appearing on various “Billboard” and “Cash Box” charts, the song itself was doing quite well, thank you. There were charts that still considered how well a song is doing, not only using sales in stores, airplay and juke box play as criteria, but sales of sheet music–and perhaps even piano rolls, which were sill being made. 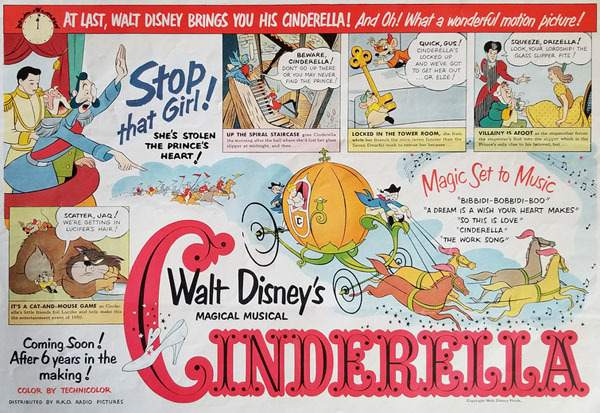 Both “Billboard” and “Cash Box” kept such charts, and the Disney ditty tended to do better on thee charts than any of the individual records did. “Billboard” magazine featured their “Honor Roll of Hits’, which only counted up to ten. “Bibbidi-Bobbidi-Boo” spent several weeks in this chart, getting up as high as #7. The “Cash Box” chart produced a similar result. And, as “Cash Box” counted up to forty, the song lasted longer on their chart than on that of “Billboard”–from the end of December, 1949, into April, 1950. “Your Hit Parade” was a popular NBC radio (and later television) program, that offered listeners the Top Seven Songs of the week, as performed by their hose singers, who included Frank Sinatra (1944-45 and 1947-49), Buddy Clark, Eileen Wilson, Beryl Davis, and (later) the likes of Snooky Lanson, Russell Arms, Dorothy Collins (married to the show’s bandleader), and Gisele MacKenzie. All this, plus “Lucky Strike Extras” (standards, used to fill time) and seemingly-endless hard-sell commercials for Lucky Strike cigarettes. Nobody on the program, nor in the industry, knew exactly how American Tobacco and/or their advertising agency, compiled their charts. All the staff knew was that the list of songs would come down from On High on Monday–and that, by Saturday night, they’d have a tight, smooth program; a credit to both the songs and to Lucky Strike. 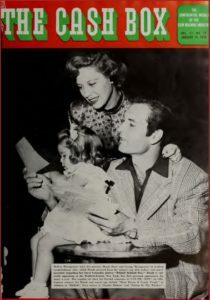 “Bibbidi-Bobbidi-Boo” entered the “Lucky Strike”charts in early February of 1950, and was there through the middle of March–with one week in the middle off the Top Seven. It’s highest position was at #3. No doubt that, week by week, the song was batted around so that each of the singers featured on the show got to sing it at least once. IF anything brought movie moguls to agreement in the early part of 1950, there were two things upon which they would agree. One had to do with the “menace” of television. The other had to do with the revival of he foreign markets. Before Worle War II–as now–foreign markets provided a most pleasant shot in the arm when it came to a film studio’s bottom line. And where the movies went–so, too, went the songs. 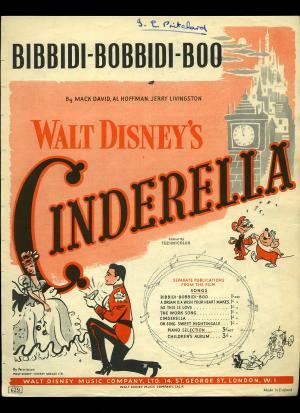 “Cinderella” premiered in London, and in Sydney, during the fall of 1950. And record companies in the two countries were interested in the songs. While local firms may have recorded the airs from the picture, the audiences in both Great Britain and in Australia were showing a decided preference for American versions of American songs. And, as in the USA, the song from “Cinderella” that attracted the most attention was “Bibbidi-Bobbidi-Boo”. Decca in England–only tenuously connected with the American label of that name–imported American recordings from Decca, and issued them on the Brunswick label. And both of Decca’s coves of “Bibbidi-Bobbidi-Boo” were issued there. Brunswick 04577 (78 only) featured Sy Oliver’s performances of “Bibbidi. . . ” and “A Dream Is A Wish Your Heart Makes”. Meanwhile, Brunswick 04580 had Bing Crosby’s version of “The Magic Song”–coupled differently from the American issue.The version by “Der Bingle” also appeared in Australia, on Decca. We don’t have full information as of yet. According to the early–and possibly primitive–charts being kept at the time, Bing had to share sales with an HMV release of the Ilene Woods and the Woodsmen version, which appeared here on the RCA Victor Bluebird series. Another place where “Cinderella” played was in Occupied Japan. Our Boys over there–and in Korea–must have relished the pure escapism of a Disney cartoon feature. And some of them may have heard a fourteen-year-old Japanese thrush singing a bilingual version of “Bibbidi-Bobbidi-Boo”. The labels of the King records (not connected with the US label of that name) would call her “Chiemi Eri”–although she herself would have announced herself as “Emi Chieri”. However it is said, she was making a name for herself recording bilingual versions of American pop hits–such as “Tennessee Waltz”, “Come On-A My House”, “Pretty-Eyed Baby”, “Shrimp Boats” and “Istanbul (Not Constantinople)”. The accompanying orchestra makes a concerted effort to play swing music at one point–and gets an “E” for effort. There may be other non-English-language versions of these songs–but they have not yet crossed anybody’s path outside their home countries. Just wanted to publicly thank you for letting me sneak into your spot last Sunday to celebrate Mickey Mouse’s birthday with fun facts on Steamboat Willie. Very kind and gracious. This also gives me an excuse to also thank you for all the research you do and sharing it with the rest of us. You always have information I never knew and you help the rest of us put into proper perspective the songs you showcase. I just hope that I’m in as good shape if I get to ninety years of age. I love the Japanese version the best. Really.